LAS VEGAS – A lightweight fight between former two-time World Champion Jorge “Niño de Oro” Linares (35-3, 23 KOs) and exciting Japanese contender Nihito Arakawa (24-3-1, 16 KOs) has been elevated to open the SHOWTIME PPV presentation of “TOE TO TOE: CANELO VS. ANGULO,” a four-fight pay-per-view event airing live this Saturday, March 8, (9 p.m. ET/6 p.m. PT), from the MGM Grand Garden Arena in Las Vegas. The 10-round match was promoted to PPV status after an injury to Omar Figueroa forced the cancellation of his WBC Lightweight World Championship defense against Ricardo Alvarez. 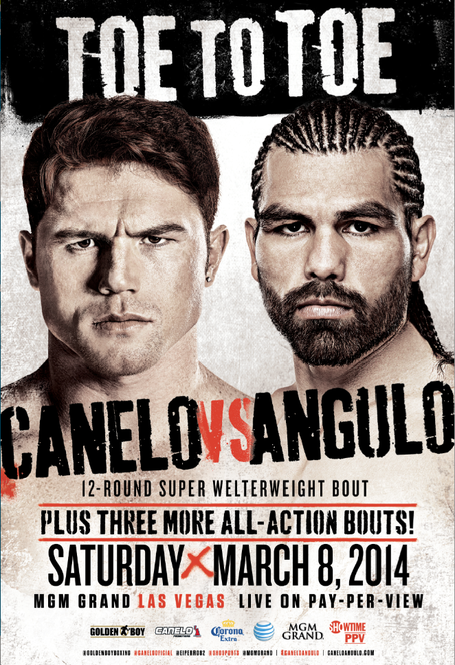 “Canelo vs. Angulo: COUNTDOWN LIVE,” a one-hour preview show, will now air live onSHOWTIME® at 8 p.m. ET/5 p.m. PT and include special features, analysis and interviews preceding the live pay-per-view quadrupleheader. The undefeated Figueroa injured his left hand during training last Friday. Ricardo Alvarez, older brother of Canelo, will remain on the card and meet hard-hitting Sergio “Yeyo” Thompson (28-3, 26 KOs), of Cancun, Mexico, in the top 10-round bout on the non-televised portion of Saturday’s big fight card at MGM Grand. Thompson, 30, has triumphed in 14 of his last 15 fights, winning all 14 by knockout. In his most recent outing, he registered a first-round knockout over junior welterweight Cesar Chavez (21-4 going in) last Dec. 14. The power-punching Thompson scored an impressive second-round TKO over Linares in March 2012. In Saturday’s 12-round main event, popular former world champion and Mexican boxing superstarCanelo Alvarez (42-1-1, 30 KO’s) will face dangerous and determined countryman Alfredo “El Perro” Angulo (22-3, 18 KO’s) in a super welterweight bout. The two world title fights on pay per view will match undefeated two-division world champion and current WBC Super Bantamweight titleholder Leo “Terremoto” Santa Cruz (27-0-1, 15 KOs) against former three-time world champion Cristian “El Diamante” Mijares (49-7-2, 24 KOs) and IBF Junior Middleweight Champion “King” Carlos Molina (22-5-2, 6 KOs) against undefeated Jermall Charlo (17-0, 13 KOs). Tickets for the event promoted by Golden Boy Promotions are on sale and priced at $600, $400, $200, $100, $50 and $25, not including applicable service charges and taxes, with a total ticket limit of 10 per person. To charge by phone with a major credit card, call Ticketmaster at (800) 745-3000. Tickets also are available for purchase at www.mgmgrand.com or www.ticketmaster.com.